Packed with every top-tier component currently available, this Falcon Northwest Mach V is meant for serious work, but that didn't stop me from playing games. Every time a UPS or FedEx delivery comes it sounds like Cujo is in my house. This happens on regular basis, but today I'm nearly as excited as my dog. When I open the door I'm greeted by a very large box—well, I'm actually greeted by the FedEx person, but I only have eyes for the box. It's not quite as extreme as the wooden crates used by Origin, but after signing for the delivery I ask for help dragging the beast into the front room. It's not every day you get to test a gaming PC that costs as much as a decent used vehicle—even if it's not exactly meant for gaming. I asked Falcon Northwest to send me a no-holds-barred rig, and that's exactly what I got. 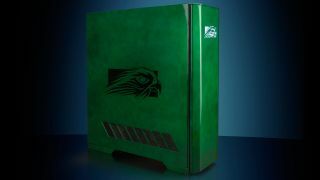 Inside the box is a custom painted Falcon Northwest Mach V PC, literally packed to the gills with every piece of extreme hardware imaginable. It's easy to scoff at the price, but when you start to break things down, it's really not much worse than the typical 15 percent markup on most PCs. Just the parts alone would set you back about $12,000. Add in the extensive burn-in testing, 'free' overnight shipping for repairs during the first year, a 3-year parts and labor warranty, and just the overall feeling of panache, it's not too hard to see where the price comes from. Its ludicrously expensive price tag is why I'm choosing not to score this review (though we did give it a 9 in Maximum PC magazine). For PC Gamer, think of this as a look at what does—and, more importantly, what doesn't—pay off when building the absolute gnarliest PC currently possible. But this isn't a PC built for gamers. It has the potential to be the fastest gaming PC around—when the stars align—but the price for that potential, not to mention the actual gaming experience, cannot possibly justify it. Even if you have money to throw around, you're far better off dropping down to a Core i9-9900K, dual RTX 2080 Ti cards, and 64GB of total memory. Falcon Northwest can do that for you as well, if you want, and the price is only $8,119. Or you can trim down the storage setup and go with a single GPU and land closer to $5,000. But where's the fun in that? Between the GPUs, CPU, cooler, and RAM, that's $8,500 in this photo. Crysis? No problem! At 4k with maxed out settings and 4xAA, the Mach V still averages 122fps. It didn't even break a sweat. Let's start at the top, with the pair of Nvidia's beastly Titan RTX cards, running in tandem with an NVLink bridge. Each has a whopping 24GB of GDDR5, and together these represent one-third of the price if you're keeping score. Outside of professional GPUs like the Quadro RTX 8000, there's simply nothing faster. The same goes for Intel's Core i9-9980XE, which Falcon overclocked to 4.2-4.9GHz depending on how many cores are in use. A good liquid cooler is absolutely necessary, as CPU-intensive tasks can cause system power draw to peak at more than 650W, 400W of which comes from the overclocked processor. Load up the GPUs and this PC can peak at 950W at the outlet. Yeah, that 1200W Platinum PSU is actually required! The rest of the specifications are similarly impressive, with top-of-the-line memory, motherboard, and storage. There's 8TB total of solid-state storage, half of which comes in a pair of RAID 0 Samsung 970 Evo M.2 SSDs. RAM is also maxed out with eight G.Skill 16GB DDR4-3000 DIMMs. The IO ports are on the top, thanks to the custom chassis. Wrap it up in a very large custom EATX chassis designed by Falcon Northwest and you're ready to rock. The chassis orients the graphics cards vertically, and there are stabilizers connected to keep the cards in place. It's a smart design, since running multiple GPUs can put a lot of weight on the PCIe slots normally. For good measure, Falcon added in an Exotix paint job, a $1,300 extra that can be customized as you see fit. Rigs like this are truly a sight to behold. You could build a similar system for less, but anyone considering this level of hardware supremacy is probably part of the "time is money" crowd. Most likely, it's not even intended for gaming use—though it can certainly play any game you might want to run on it. This X299 Mach V build features workstation class hardware, with components and features that give Nvidia's DGX Station a run for the money. Yes, it has two fewer GPUs than the DGX Station, but let's be clear: you can buy three of these Mach V systems for the price of a single DGX Station—and still have several thousand dollars to spare. And while you won't get the Tesla V100 32GB cards found in the DGX Station, you will get the enhanced ray tracing features and gaming performance of the newer Turing RTX cards. That's precisely the sort of use case that's popular with Falcon's customers, or so I'm told. But you're probably here for the games, a peek into what sort of performance you can expect from the most bodacious hardware currently available. Diminishing returns and SLI woes be damned, let's see the benchmarks! No, I don't mean Crysis. Can it run Crysis? Hell yeah, but then that hasn't really been a problem for a while. 4k, maxed out settings, 4xAA, and the Mach V still averages 122fps in Crysis, with minimums of 75fps. No sweat. But what about newer games—games that can put the ray tracing hardware to good use? For reference, I put one of the Mach V Titan RTX GPUs into my standard graphics testbed as a reference point. That's a Core i7-8700K overclocked to 5.0GHz—one third the cores, higher clocks, and better latency for some tasks, particularly games. As we'll see in a moment, such a PC still generally wins out on gaming performance—X299 and Skylake-X processors end up with some compromises that don't usually benefit games. I'm only including the 4k ultra results here, but at 1440p and below, Titan RTX SLI doesn't do so well. I've also included several other high-end to extreme GPU configurations by way of comparison. First, the good news: The Mach V with Titan RTX SLI wins out in the overall performance metric. It's not a big win—11 percent faster—but it's a win. The bad news: Out of 13 games tested, half (seven) show no performance improvement or even a negative delta compared to a single Titan RTX. It's also worth pointing out the Titan RTX performance relative to a 2080 Ti, where it's only six percent faster for more than double the price. I knew this outcome was likely, and it's why I haven't recommended SLI or CrossFire as a reasonable gaming solution for several years. There are games where it works great—Strange Brigade being the poster child for multi-GPU scaling—but they're becoming increasingly rare. In contrast, benchmarks that take advantage of multiple GPUs look much better. 3DMark Fire Strike Ultra scored 16,847 and 3DMark Port Royal scored 16,861. The problem with ray tracing is that none of the games so far support multi-GPU with DXR. Also of note, while I didn't include graphs showing DirectX Raytracing (DXR) performance in any of the games that support the technology (Battlefield 5, Metro Exodus, and Shadow of the Tomb Raider), I did test those games. BF5 averaged 79fps at 1440p ultra, and 52fps at 4k ultra. Metro Exodus is even more demanding, getting just 67fps at 1440p high (not ultra!) and 39fps at 4k high. Shadow of the Tomb Raider ends up in the middle of those two, averaging 85fps at 1440p ultra and 46fps at 4k ultra. That's without DLSS, however, which boosts performance by about 30 percent at 4k. The problem with all of those games is that the DXR implementations being used do not currently utilize multi-GPU setups. That's a shame, because if ever there was a category of games where multi-GPU could make sense, it's DXR. So gaming on the X299-based Mach V is mostly a bust—or at least, not particularly impressive, considering the price and specs. But what about workstation use? The Titan RTX cards do have one notable advantage compared to a regular GeForce RTX card, namely, driver optimizations for certain professional applications. SPECviewperf 13 is a standard industry benchmark that measures performance in exactly those types of workloads—Maya, SolidWorks, and more. Comparing my GPU testbed with an RTX 2080 Ti to the Falcon Northwest Mach V, a few of the SPECviewperf tests really put the extra CPU cores and professional GPU drivers to good use. Showcase is slightly faster, Solidworks performance is 25 percent higher, Energy is nearly 60 percent faster, Catia is close to 70 percent faster—and then there's Siemens NX (SNX), where the Titan RTX is 19 times as fast. That's the best-case sort of workload. Of course, there are other professional applications where the 2080 Ti rig is basically tied with the Mach V. The 3ds Max, Creo, Maya, and Medical tests all slightly favor my standard GPU testbed, a bit like in games. Still, depending on what software you're running, the semi-pro Titan RTX can be a worthwhile upgrade. Basically, Titan RTX has many of the same driver benefits as a Quadro RTX 6000 card, but it costs $2,499 compared to $4,000. 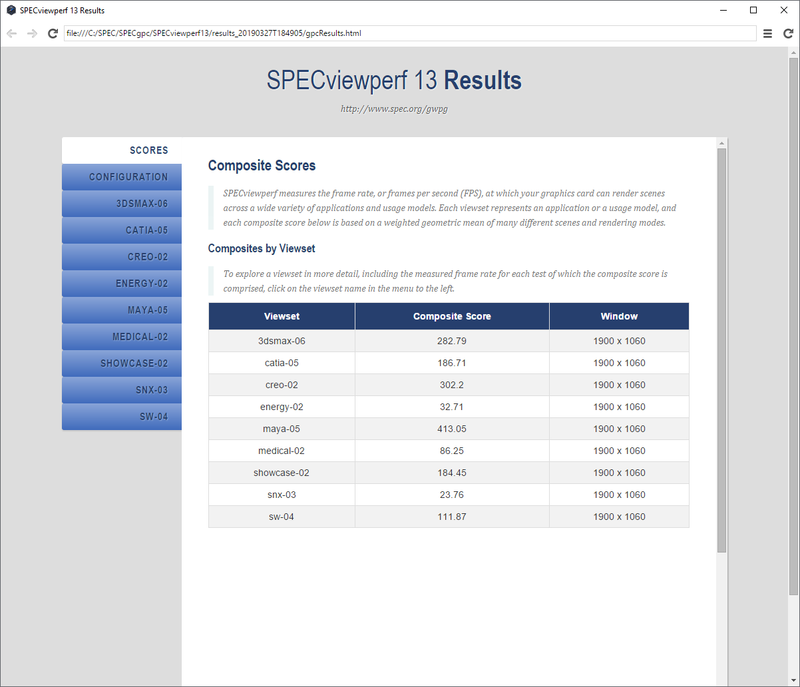 Interestingly, none of the SPECviewperf 13 tests benefit from the second GPU. That's not to say there are no professional applications that will use multi-GPU, but support tends to be limited. Software developers and AI researchers who want to explicitly work with multiple GPUs can obviously use both graphics cards. Other benchmarks outside of games show similarly impressive performance. The Mach V scores 4,099 in Cinebench, and the RAID 0 OS drive manages 3260MB/s read and 3161MB/s write performance. It appears to be running the M.2 SSDs through the PCH, which means throughput is limited to the DMI 3.0 connection. Still, you're not likely to get any faster from storage performance for a while, not without an interface upgrade. You don't need this sort of rig for pure gaming purposes, or plenty of other tasks to be frank. It's complete overkill, and an increasingly large number of games (and other applications) don't even have working multi-GPU support, meaning one of the Titan RTX cards is often sitting idle. As impressive as this Mach V is, it's not something we recommend for dedicated gamers, no matter how deep the pockets. You'd be better served building your own high-end PC, or even an extreme gaming PC, for a fraction of the cost. Very few gamers have a need for more than 2TB of SSD storage, or a Titan RTX, or an X299 motherboard and CPU. Z370/Z390 is a much better value and is faster in games. If you're looking for something a bit less extreme, it's easy to trim down the specs to get a far more reasonable—though still exotic—build from Falcon Northwest. But if you're into cutting edge research or you want to work on creating ray traced games or machine learning? The only way you're going to significantly improve on the Mach V is to wait for the next round of GPU and CPU updates, which could be a year or more away.